What can AI do to provide an antidote to this and help retailers work smarter? Download the full results to find out how retailers are adapting to a changing market using new technologies. 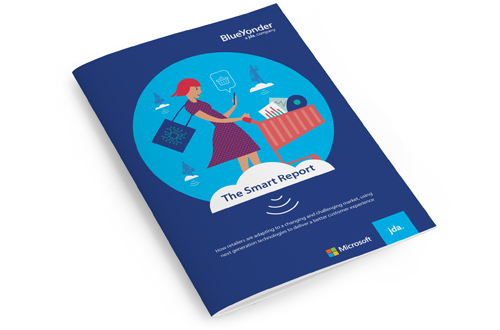 In association with Microsoft, Blue Yonder/JDA commissioned a global research study with 200 brick & mortar retailers in the US and Europe to explore the issues in more detail. The retail landscape remains challenging and many retailers are turning to technology to deliver the customer experience and operational efficiencies that modern retail demands. To understand how retailers are leveraging the latest technologies to achieve competitive advantage and deliver for their customers, Blue Yonder, a JDA company, in collaboration with Microsoft, commissioned a global research study with 200 retailers in the US and Europe. ‘Packaging AI as retail’s fast fix for sustainability’ drills down into how fast fashion and plastic packaging is proving to be a toxic mix for the environment. What can AI do to provide an antidote to this and help retailers work smarter? ‘Retail Weak. Brand Strong’ looks at how brands have responded to the power digital has given consumers to have their brands anytime and anyplace. ‘The department store is dead. Long live the department store’ explores why some department stores are failing, what makes the successful ones get even stronger. ‘Offline's taking a customer experience lesson from Online’ investigates the lessons that stores are learning from online. Download the full results to find out how retailers are adapting to a changing market using new technologies. 2018 Smart Report summary of findings. New Blue Yonder/JDA survey reveals retailers face major risks to business without AI and automation. New edition: for the latest news, opinions, and trends in retail AI innovation. Prepare for the next digital disruption in retail.